Gilby Clarke needs no introduction to rock fans. He played in both Guns n’ Roses and the MC5. Who else can claim membership in two of the most life-altering rock ’n’ roll outfits to ever exist on the planet? Clarke hit the stage with his GN’R running buds at the 2012 Rock ’n’ Roll Hall of Fame induction ceremony – he appeared on the band’s The Spaghetti Incident, Live Era ’88-’91 and Greatest Hits albums, and spent years on the massive Use Your Illusion world tour in the ’90s - but his proudest GN’R moment is, he says, the Gilby rolls mode on the GN’R pinball machine! Before joining the GN’R circus, the guitarist bounced from the great Candy to his own, heartbreakingly ignored, big-riff quartet Kill for Thrills. Clarke has, along the way, toured, and/or recorded with everyone from Nancy Sinatra to Heart to Gene Simmons to Slash’s Snakepit. In between touring & recording he was making videos with not only GNR, but Michael Jackson & Slash when MTV was de rigueur. Perhaps you saw him starring alongside Mötley Crüe’s Tommy Lee on Rockstar: Supernova or VH1 Honors with Rob Zombie, Slash & Ace Frehely? Then there’s his solo career that earned him critical winks and sales for such albums as Pawnshop Guitars (including the American hits Cure Me ... Or Kill Me, and Tijuana Jail), The Hangover (two songs made Bruce Willis’ The Story of Us), Rubber, 99 Live & Swag. 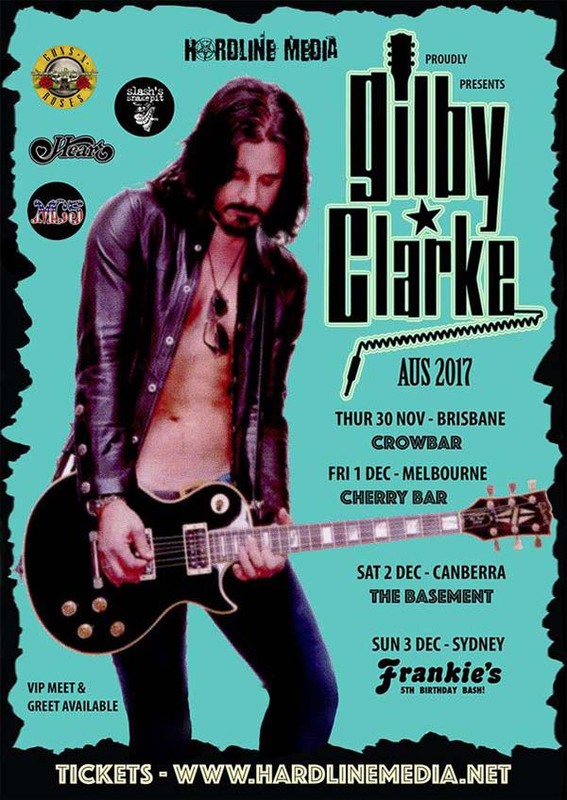 Gilby is hitting the east coast of Australia for some intimate, sweaty, raw, totally Rock ‘n’ Roll shows! Gilby will be ripping up a selection of hits from his past bands Guns N Roses, Slash’s Snakepit, RockStar Supernova, MC5 and much more with full band in tow.